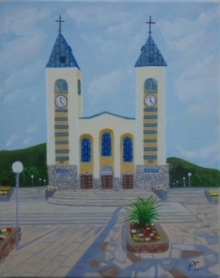 The Parish of Medjugorje is situated in the southern part of Herzegovina in the present-day state of Bosnia and Herzegovina. In order for the reader to have a complete picture of the situation, climate, irrigation and vegetation of Medjugorje, it is essential to have a better look at its surrounding areas. Herzegovina is situated between two regions: a mountainous region to the north and a coastal region to the south. The mountainous wall to the north holds back the circulation of atmospheric masses from the Mediterranean, creating favourable climatic conditions for various vegetal cultivations in the area of Herzegovina. Herzegovina covers an area of 9,948 square kilometres. It is bordered to the east by Montenegro, to the west by Bosnia, to the south and southeast by southern Croatia and in one area forms part of the Adriatic coast. The main cultural and administrational centre is Mostar.